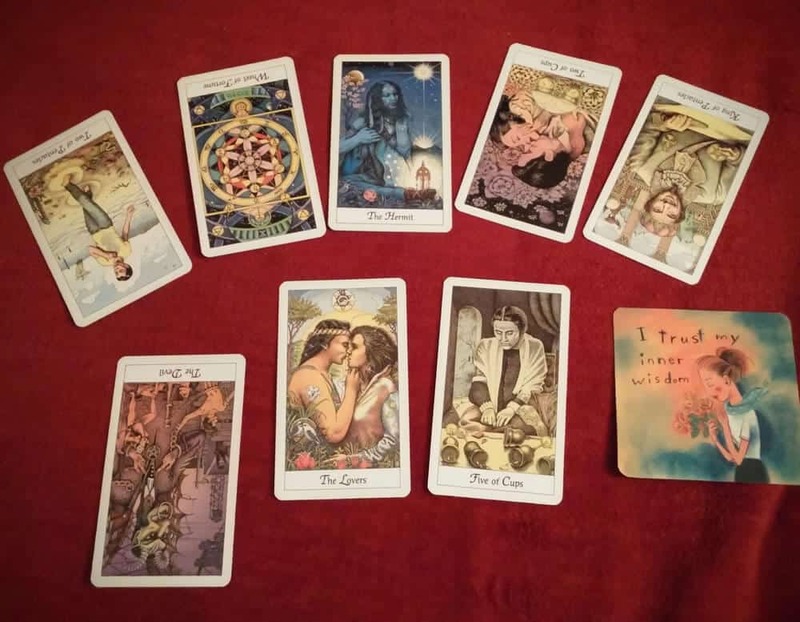 Tarot reader observation: LOTS of transition, upheaval and serious change in the air. And I know from experience, those exceptionally disrupted times, the tide ebbs and flows. There are easier days and harder days. Easier hours and harder hours. And you can’t do squat about those waves, of overwhelm and struggle that sometimes roll in. You only have control over how you ride the waves. This week? Reversed cards tell me it’s not smooth sailing. Lots of Major Arcana, so serious implications to the issues that are active. Most of the cards are supportive and there are a number of friendly influences, but there’s an undeniable edge. Those waves have a bite to ’em. Surf’s up, so hop on your board. Monday, Two of Pentacles rx: Prioritize and drift away from the extraneous or something’s gonna get dropped in the shuffle. Tuesday, Wheel of Fortune rx: No, everything may not FEEL like it’s going your way, but that doesn’t mean it’s not a blessing in disguise. See the benefits as well as the frustrations and don’t discount what you don’t yet see. Thursday, Two of Cups rx: Another mixed bag day. You could focus on what you like, or what you don’t. Either’s valid. Just use whatever you focus on to help you move forward, you know? Friday, King of Pentacles rx: Budget your energy. Only spend it with those that add to your life and whom you feel good about sharing it with. Saturday, The Lovers: Date night? Date with yourself works! This is an easy-going, in the flow vibe. Use it for joy. Sunday, Five of Cups: Well ow! Not what we’re hoping to see after happy date night. Feelings of sadness, mourning and loss mayb come to visit…Good day to be kind to yourself and wrap up in some loving feelings, wherever you keep your favorites. Overview/Advice: The devil reversed. Be aware of what your attached to. Is is serving you? Is it healthy and balanced? Because I certainly appears to be a choice, even if you don’t always recognize the fact. Opportunity this week to free yourself of some weight if you opt along those lines. Affirmation: I trust my inner wisdom. Listen for the cues. Those are the ones we sometimes dismiss, for lack of trust or energy or desire to make useful changes. Keep doing a gut check, seeing what gives you joy versus what stresses you out when you consider it. Even if you don’t know why–especially if you don’t know why–listen anyway. This week’s forecast features the Cosmic Tarot and Louise Hay’s Affirmation cards. If you dig the forecasts, you might like my book, Everyday Tarot Archives. Get a personal consult here.